Explore the island of Key West in one of the most unique ways possible. Captain your own private pontoon boat for 4 hours and bring up to 8 people! Traverse the waters around Key West in your very own pontoon boat! Take along eight of your family and friends for a half day cruise through some of Key West's most popular sites. Enjoy your day relaxing in the sun on the deck of this 22 foot pontoon boat. Or feel free to spend your time in the shade, under the bimini top while you sail the waters around the island. Bring your own snorkeling gear and anchor off some of the best snorkeling spots Key West has to offer. 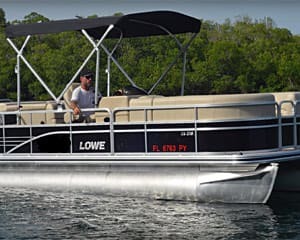 Fully equipped with GPS and VHF radios, you'll feel at ease behind the wheel of this top of the line pontoon boat. Bring up to 8 of your family and friends for a private party cruise off the shores of Key West!